"Oh, hi guys. I do hope you're not feeling all killy-killy, stabby-stabby." The Legends take a hard turn into the ridiculous and come out the other side in their penultimate episode of the season. All this, plus Barack Obama. While watching this week's episode it's hard not to imagine some sort of bet in the writers room in which they were going to just keep pitching any ridiculous thing they could think of until someone finally said, 'Okay, you can not be serious.' And no one ever said it. 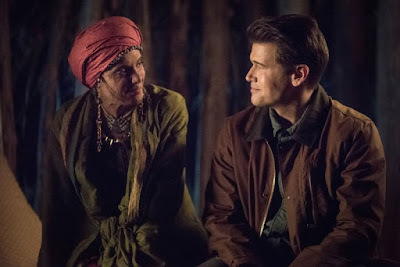 So we get a young Barack 'Barry' Obama who's attacked by a giant psychic gorilla before offering solid emotional support to a time travelling bisexual ninja regarding her estranged clone girlfriend, a plot-relevant and yet still somehow entirely gratuitous stop on the Lord of the Rings set, and a last minute switcheroo in which our heroes and our villains decide to try swapping goals with one another just for funsies. And yet despite, or perhaps because of, all the wacky hi-jinx, this episode also delivers heartbreaking loss and a truly horrific existential crisis before even reaching the 'all is lost' moment which gives us the cliffhanger for next week's finale. If we're going to talk about the things that worked this week, we have to begin with Neal McDonough. The fact that Darhk's double double betrayal completely works this week – and make no mistake, it completely works – is because he sells his love for his daughter so completely. Just go back and watch the way he tears up when he says that when he comes back Nora will be gone. It makes absolute sense from that point on that he will do anything to try to save Nora, which justifies both his going to the Legends for help and his later betraying the Legends for just the tiniest possibility that he can stop Mallus from consuming her. Credit to the show, I really did not see the second betrayal coming, although I probably should have realized that they set up Grodd in the beginning so that they could use him at the end. In many ways this episode is 'City on the Edge of Forever,' which is in itself just one example of one of science fiction's favorite ethical dilemmas. Specifically, is it ethically acceptable to allow something terrible to happen to someone innocent in order to prevent a greater evil from happening to a larger number of people. This is kind of the central premise of Utilitarianism, and if you're interested in that kind of thing there's a whole bit about it in The Brothers Karamazov, but the interesting thing about it is that sci-fi doesn't really have a universally accepted answer to the question. Generally time travel stories err on the side of 'keeping the integrity of recorded history intact, because we have no way of foreseeing the terrible knock-on consequences of making changes.' Indeed, that was the entire point of Flashpoint, and now for the first time I understand why it's important that Wally joined the Legends in time to be a part of the debate, as he witnessed Flashpoint first hand and can make that case with full audience support. On the other hand, Zari's spent most of the season actively working against this principle with her loophole algorithm, and the show clearly wants us to see her as having at least equal moral high ground on the issue. 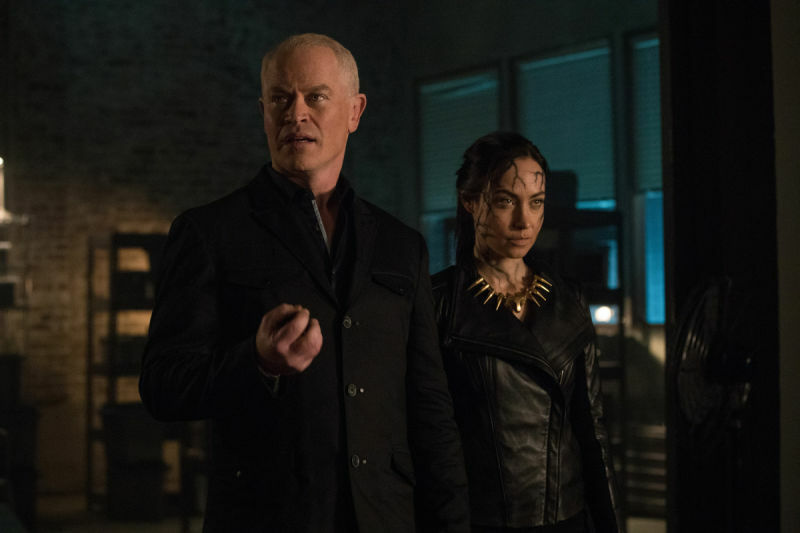 Darhk wants to maintain the integrity of the timeline now, but only because that gets him what he immediately wants – his daughter's safety – and so we're inclined to view his opinion as less valid. But Amaya is coming down on the other side of the question for exactly the same reasons – because it immediately protects people she loves. The other side of the debate, for those interested in doing a little follow-up reading, is 'Categorical Imperative,' and Kant is a good place to start if you're curious about it. The real point here is that the Legends writers have crafted a scenario in which everyone involved has motivations that are so complicated and so full of gray area that I was just able to work a discussion of Utilitarianism into this review and it only felt partially gratuitous. That's not something you can say of every show, particularly ones that include a psychic gorilla. It was a good decision to make the 'last straw' anachronism something so personal to the team. 'Peril to the timeline' is a little abstract as a concept to resonate with viewers, but 'if you prevent your family from being butchered then the entire world will be destroyed' is as visceral a concept as they make, and it really personalizes the stakes for the season. There was a nice sense of nobody really being sure what they even wanted to happen, and Sara's speech about preferring to release and stop a demon rather than fighting a friend was a beautiful moment of recognizing that they had no entirely good options and pulling the team together anyway. I'm not sure what to say about Ava other than it genuinely never occurred to me that she wasn't even the first 'Ava' that Rip had recruited, and the moment when Ava realized mid-line that she was just the latest model broke my heart for her. 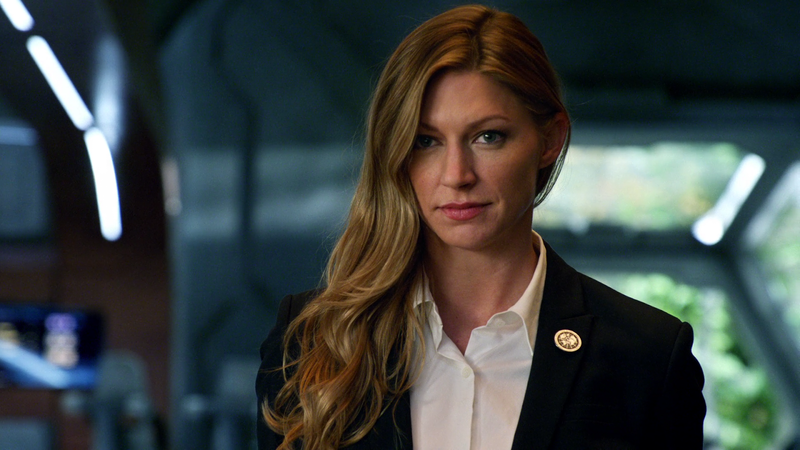 I'm more and more impressed by Jes Macallan every week, and I really, really hope we don't lose her in the finale. We're just one anachronism away from the Temporal Zone disintegrating completely. Also, I finally noticed that they refer to it as the Temporal Zone, which means I have to stop calling it the Time Vortex. It seems more and more clear that Mallus' initial attempt to escape his prison was due to the Legends 'breaking time,' although it would be nice if they stated this explicitly since it makes the whole problem their fault. Also, if time doesn't disintegrate, then at some point in the future Amaya wipes her own memory and returns home. Probably not in that order. The question remains whether we'll lose both her and Nate at the end of the season. Jury's still out. This week our team went to Occidental College 1979, which is apparently in L.A. I had to look that up, as I am a Minnesota boy and know very little about your coastal colleges. Obama did in fact graduate from there in 1981. I also had to look that up, because I care about you people. They also went to Zambesi in 1992. We aren't given any real indication which vehicle/time courier was used to go where other than Amaya had already stolen the jump ship, so nobody else used that. It's kind of implied that the Waverider is in L.A., so we can probably assume that Nate and Wally were sent to Zambesi by Ava's time courier. Or by Darhk's magic rock. Or something else. Honestly, does anybody else remember when we only had one method of time travel available to our characters? Nate: "No, 131 is not... is it?" Ray: "Yeah. Does that mean no pancakes?" Sara: "The rest of us? We're on Obamacare." Grodd: "Time to make America Grodd again!" Sometimes this show is not entirely subtle. Ray: "Yeah. Come on, teeny tiny Grodd." Nate: "Nice to meet you. I'm a PhD student doing history research. Andy Watkins." Wally: "No one cares about the cover story." Nate: "Shut up, Darren Applebottom, talent scout for the New York Knicks." Sara: "I really like Barack." Obama: "Well, 'Barack' is what it says on my birth certificate." Sara: "Yeah. you might want to hold on to that." Sometimes this show is not remotely subtle. Darhk: "Okay, new guy on the team here. Is that a joke plan or a real plan?" Ava: "There is no 'me' to love." 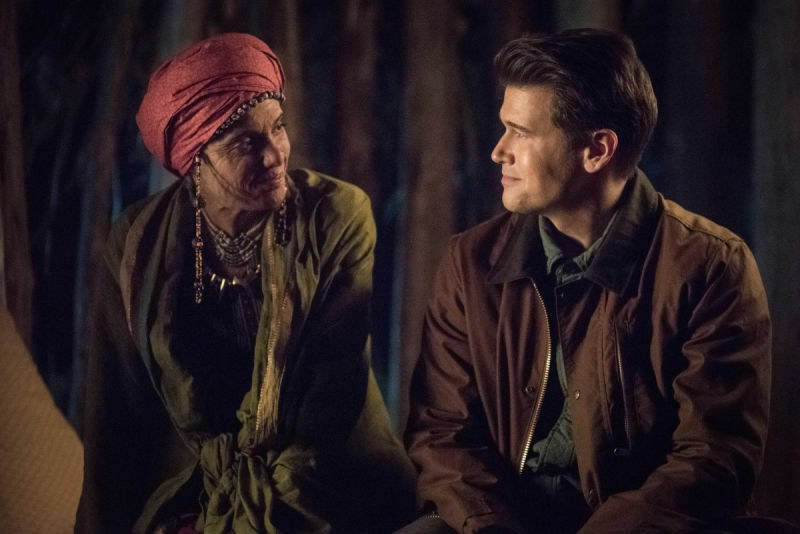 Wally: "Short version: Nora's on the ship tripping on Mallus juice, Damien Darhk gave us the water totem after they saved Barack Obama, and... uh... we are here to help you create the anachronism so we can release Mallus, and then we can kill him." Ray: "Oh, and I met John Noble." 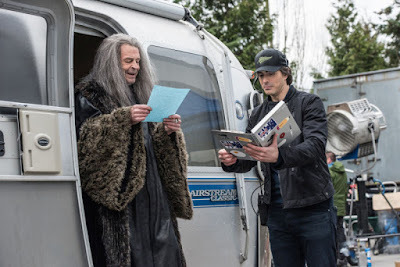 -- Brilliant use of Mick watching Lord of the Rings to justify the idea of getting John Noble to run some helpful lines. I can't decide whether it was weird that no one mentioned that they met J.R.R. Tolkien last year. -- I could have watched Sara and Damien's conversation about growth and forgiveness for a solid hour all on its own. -- I want to hear the rest of Ray's song about Nate's codes. -- Code 222 is 'we're screwed no matter what we do.' This feels like a useful thing to have shorthand for. I'm probably going to start using it in real life. -- Grodd's size was awfully inconsistent even before Ray shrunk him. He's a lot smaller going through the dorm room door than he is outside, for example. -- Speaking of, how did Darhk re-embiggen Grodd later on? -- There was a particularly nice edit between Grodd about to be shrunk and Mallus' shadow shrinking. -- Darhk helping them out with their magic circle was endearing. And he seemed genuinely apologetic about what happened to Kuasa. -- Was it just me, or was Amaya's old age makeup particularly sub-par? -- As wonderful as Sara and Barack's heart to heart scene was, I really want to see how that conversation started, exactly. -- In a parallel universe, there's a crew of the Waverider that includes Barack Obama and Elvis. Fan-fic writers, you know what you have to do. -- Lovell Adams-Gray, who played young Obama, totally nailed the role. A wonderful penultimate episode that set the stage for what looks to be a huge finale. All the better because, unlike last year, it didn't give away what the solution to the finale will be. Can't wait to see how they resolve all this. Three and a half out of four tiny gorillas. Jes Macallan was promoted to regular for season 4, but that does not explain anything since she could very way die and they will have another clone of her as a Big Bad or something Laurel like. Great way to use John Noble in person and not only his voice for Mallus. Patrick beat me to it, in that I was also going to mention Jes Macallan had been promoted to series regular, which is great news! I was also so worried that she would die in the finale (she still might, but we at least know the actor isn't disappearing). Great review, btw. I really enjoyed reading about Utilitarianism and Categorical Imperative. It makes me want to research more on the topics. This was a fun ep, and I loved how meta it got with John Noble. Hey, it's not every reviewer who knows enough about Utilitarianism vs. Categorical Imperative to work it into a review! I laughed through nearly all of this entire episode. The John Noble thing was absolutely wonderful. So was the visit with young Obama -- I agree, excellent casting. I particularly liked that Sara told him, "I really miss you." So say we all. How much. This thing with the totems and Mallus has left me cold, but what Damien did worked for me. A ha. There's the emotion, the resonance. 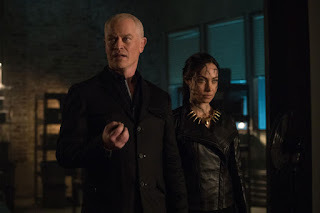 What is this series ever going to do if Damien Darhk is no longer an active villain?